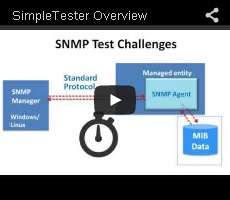 SimpleTester™ is an easy to use test tool that automatically tests SNMPv1, SNMPv2C and SNMPv3 agents. Using this tool you can exhaustively test agents implementing standard and enterprise specific MIBs within minutes. Over 1100 semantic validation tests for popular MIBs like MIB-II, RMON, SNMPv3, and NTCIP are included with source code. Utilities like MIB browser, Trap Checker and Script Generator, along with scripting support for Telnet, Serial I/O, and STMP are also present. Ideal for an individual tester.